On your marks, get set, hunt! Dust off those baskets, sharpen those elbows, it's time to get some eggs, and judging by the plethora of "eggs-travaganzas" this weekend, the Easter Bunny has been very busy. 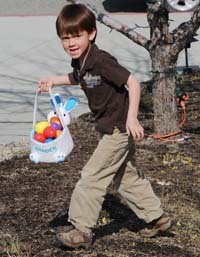 Start out the Easter weekend with Sun Valley Resort's egg hunt today, April 6, from 4-6 p.m. Little tykes 10 and under will swarm Sun Valley Village when the hunt begins at 4:30 p.m., and then be treated to festivities such as face painting at The Toy Store and live music in front of Bald Mountain Pizza. Saturday, April 7, Albertson's on Main Street in Hailey kicks off its Easter egg hunt at 10 a.m. for those ages 12 and under. The Easter Bunny also will be making a special appearance between 10 a.m. and noon. At the south end of Main Street, Teddy Bear Corner Preschool owner Becky Hubbard opens her Easter Wonderland from 10:30-11:30 a.m., featuring a hunt, face-painting, prizes and other activities. All ages are welcome for $3 per child. King's, on Main Street in Hailey, is also hosting its annual Bunny Hop from noon to 4 p.m.
Back up in Ketchum, The Growing Garden Infant & Toddler Learning Center hosts its inaugural Easter egg hunt from 11:30 a.m. to 2:30 p.m. Owner Molly Green opens her doors at 706 N. Washington Ave. to infants and toddlers up to 5 years old, with the promise that every child leaves with a prize. Reservations are requested at 622-6558. On Easter Sunday itself, local churches and spiritual centers host egg hunts following or during the Easter Sunday services. Our Lady of the Snows breaks out the eggs for children second grade and younger following its 10:30 a.m. Mass, and St. Thomas Episcopal's egg hunt is during its 10 a.m. service. Both are located on Sun Valley Road. Light on the Mountain's Easter service begins at 9:30 a.m., and its hunt begins at 10:30 a.m., just off state Highway 75 south of Ketchum. In Hailey, Emmanuel Episcopal church hosts an Easter brunch and egg hunt following its 10 a.m. service at 101 S. Second Ave.
North of Ketchum, Galena Lodge sends off its winter 2011-12 season with the annual Easter brunch from 10:30 a.m. to 3:30 p.m. The egg hunt begins at 11:30 a.m. The cost of the brunch and the hunt is $18 for adults and $10 for children 12 and under.